The handset is backed by a powerful 4,000mAh battery. The device supports fast charging. The Note 3 will be available in gold, silver, and dark grey. 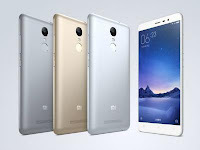 The 16GB variant of the smartphone is priced at 899 yuan (approximately Rs 9,350), whereas the 32GB variant costs 1,099 yuan (approximately Rs 11,400).